View More In Office Tape Dispensers. JAM Paper® Colorful Tape Dispensers will brighten up any desk! Made from high quiality, durable, hard plastic, these tape dispensers are great for anyone at work, home, or school! Do you incessantly search through our desk for tape that for some reason you can never find? Instead of having to keep asking your coworker for tape that you desperately need, why not get one of these high-fashion tape dispensers!? The bright colors, high quality, and super durability will make these tape dispensers a great accessory on any desk. And the sharp tape cutter will make it easy to rip off a piece without causing any frustration. The straight, geometric edges makes for a modern look, that is guaranteed to catch some eyes. And our assortment of colors in either neutrals or bright hues will match any type of personality. Great for the fasten-ista in all of us! Tape Dispenser colors are available in: White, Lime Green, Navy Blue, Black, Blue, Yellow, Pink, Purple, Red, Orange, and Grey. Size measures in at 4 1/2 x 2 1/2 x 1 3/4 inches. JAM's Tape Dispensers are very sturdy and durable! They are fashioned from High Quality Hard Plastic with a smooth finish. 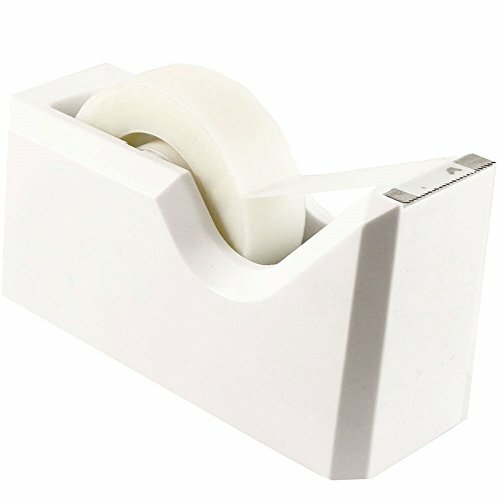 The bottom of the tape dispenser is weighted and coated in rubber to prevent it from slipping when in use! If you have any questions about this product by JAM Paper, contact us by completing and submitting the form below. If you are looking for a specif part number, please include it with your message.